For centuries, use of the waterways was so important that government put boundaries in in the water. 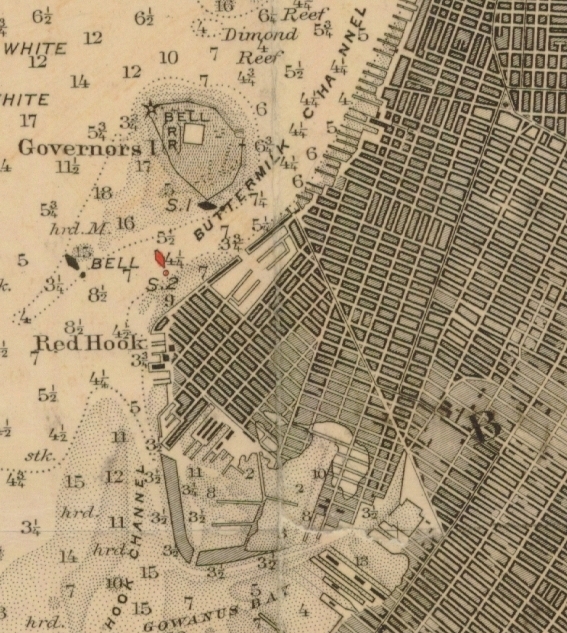 Piers in Brooklyn Heights and Red Hook are “in Manhattan” political districts as a result of early ferry wars from the 1820s to 1860s between Manhattan (then New York City) and Brooklyn (while Brooklyn was still independent). Stronger Manhattan/New York City won the battle; and as a way to control ferry service, its boundary was deemed to go to the Brooklyn bulkhead line. In terms of US Congressional representation, the land in Red Hook is represented by Congresswoman Nydia Velazquez and the piers are represented by Congressman Jerry Nadler whose district includes land in Manhattan and piers in Red Hook and Sunset Park. He does not represent the Brooklyn Heights piers (just the water between them) because of the aforementioned ferry wars. In the late 1800s, the US government began limiting Brooklyn, New York City and New Jersey from building out into the water. The feds were concerned that the federally recognized navigable waterways could shrink too much given how much new land was being created by dumping out into the water, new land that also had many new piers sticking out further into the water. As a result, the feds begin demarcating US pierhead and US bulkhead lines to control or outright prevent encroachment into the water. These are tweaked over time for new developments.